Carefully bred for centuries, the Bedouins created horses that could withstand extreme conditions of the Arabian Desert and tribal wars. It is easy to see, the history of the Arabian horse is full of legend and romance. Nowadays, the Arabian horse is valued for its elegant appearance, intelligence, stamina and comfort to mankind. Nowadays the show rings are the scenes for (more harmless) battles. Talking about Qatar, the tradition of breeding and honoring Arabian horses is woven into the very fabric of Qatar. Nowhere is this more evident than at Qatar Foundation's Al Shaqab, an equestrian center with state-of-the-art facilities does not only embodies the spirit of modern-day Qatar but also promotes the highest levels of breeding purebred Arabian horses. The 20th edition of Qatar National Purebred Arabian Horse Show was an exciting event with more than 300 horses and saw a wide-scale participation from Qatar, especially as it was open to both leading studs and individual owners. Qatar is a leader in the Arabian horse shows worldwide. At the World Championship, which was held in Paris last month, Al Shaqab and Aljassimya Farm made their presence felt. Al Shaqab’s young bay stallion Wadee Al Shaqab won Gold World Champion Senior Stallion Medal and it was again Sheikh Hamad bin Ali Al Thani, who hoisted the trophy after another Al Shaqab stallion garnered championship honors, this time at the National Show. It was the Al Adeed Al Shaqab son Ghasham Al Shaqab out of Gazala Al Shaqab, by Gazal Al Shaqab, who achieved Gold Champion Senior Stallion. Ghasham Al Shaqab’s championship was not the only success at this show for Al Shaqab Stud. The young Fouz Al Shaqab, daughter of reigning World Gold Champion Senior Stallion Wadee Al Shaqab and out of Hooria Al Shaqab, by Al Adeed Al Shaqab, garnered Gold Champion Junior Filly. The Junior Colts saw a tied decision; Amaar Al Nasser and Radad Al Shaqab both received 16 points but Amaar had the higher points in his age class so Radad Al Shaqab, by Hadidy Al Shaqab accomplished Silver Champion Junior Colts with his stablemate Moaid Al Shaqab, by Fadi Al Shaqab winning Bronze. Overall, the show was an outstanding success for Al Nasser Stud, too. Winning seems to be a family affair and HE Sheikh Nawaf Bin Nasser Al Thani, owner of Al Nasser Stud, could not be more proud, as both horses represent three and four generations, respectively, of his well-thought-out breeding program. The Gold Champion Junior Colt, Amaar Al Nasser, by EKS Alihandro out of Remal Al Nasser by Ashhal Al Rayyan was just one example. 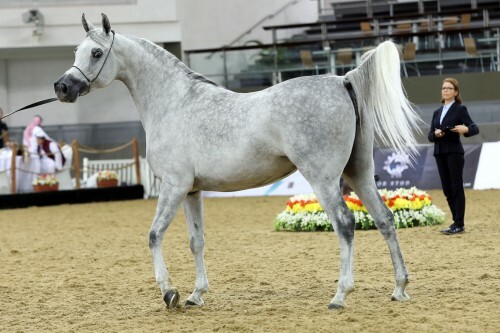 Two fine Al Nasser fillies garnered Silver and Bronze Champion Junior Fillies: Hattan Al Nasser, by Hariry Al Shaqab, and Nadrah Al Nasser, by Shagran Al Nasser. In addition, Al Nasser Stud’s Gazwan Al Nasser, by Gazal Al Shaqab received the award for Silver Champion Senior Stallion. He is out of Ftoon Al Shaqab, who also brought Hattan Al Nasser. Arabian horse lovers around the world know very well, the broodmares are of exquisite quality in Qatar, which made the Senior Mares Championship particularly exciting. Again, Al Nasser Stud was successful with its Sinan Al Rayyan daughter Maisa Al Nasser, out of Straight Egyptian lines, achieving Silver Champion Senior Mare. Bested only by a delicate beauty from Al Rayyan Farm: Sulima Al Rayyan, a precious Ashhal Al Rayyan daughter out of Selma Al Rayyan, by Al Adeed Al Shaqab. Al Rayyan also won Bronze with Nawaal Al Rayyan, by Ansata Sokar. It was also a good show for Nasser Mohammed Mesfer Al Hajri, whose filly Ahood Umm Aludham was adjusted winner of the very first class of the show (filly foals). And it was Nasser Mohammed Mesfer Al Hajri’s well-known senior stallion Al Milan, by former World Champion Stallion Al Lahab, who accomplished Bronze Champion Senior Stallion in this strong competition. Heartfelt thanks for cooperation and hospitality extended to the Arabian Horse Global Network. We are sure that the partnership between the Qatar Racing & Equestrian Club and Arabian Horse Global Network will lead our projects to a new stage.